Clinton says Trump won on vows to take country "backwards"
Hillary Clinton has blamed her election loss to President Donald Trump on the "middle" of America, which she accused of "looking backwards." Her remarks, which have been seized upon by conservative commentators as "dismissing America's Heartland," were made to an audience in Mumbai, India, on Saturday. Describing election maps from November 2016, which showed most of the central United States, with the exception of big cities, voting for Mr. Trump, Clinton said: "All that red in the middle, where Trump won, what the map doesn't show you is that I won the places that represent two-thirds of America's gross domestic product. So I won the places that are optimistic, diverse, dynamic, moving forward." She said Mr. Trump's "Make America Great Again" campaign "was looking backwards," playing on what she said were feelings in the non-urban United States of voters who "didn't like black people getting rights," or women getting jobs. That rhetoric drew a harsh rebuke from the "GOP War Room" channel on YouTube, which labelled her comments as "Dismissing America's Heartland to a foreign audience." Clinton won the popular vote by almost 3 million votes, but under the U.S. Electoral College system, each state gets one vote for each member of Congress representing the state. Clinton's loss of key states in the electoral college, including Michigan, Pennsylvania and Wisconsin, shocked both her own campaign and many political observers. Clinton, who continues to tour the world promoting her book, "What Happened," on her failed presidential bid, has previously blamed FBI Director James Comey and Russian intervention in the election for her shocking loss to Mr. Trump. "I was on the way to winning until the combination of Jim Comey's letter on October 28 and Russian WikiLeaks raised doubts in the minds of people who were inclined to vote for me, but got scared off," she told an international women's summit in New York in May of last year. 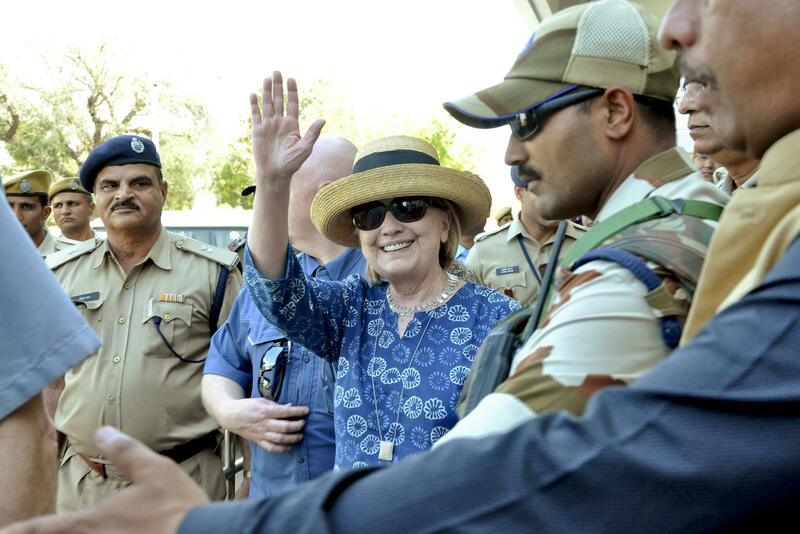 Clinton was on a private trip to India this week, which saw her give several speeches on both the U.S. election and Prime Minister Narendra Modi's policies in the Asian nation.